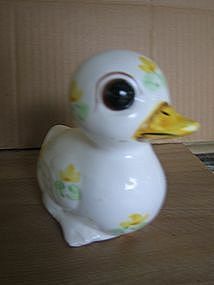 Vintage porcelain duck manufactured in Japan. Still has the Enesco label. It measures 4 1/2 x 5 x 3 inches. I am not sure of the original purpose of this duck. It has a plastic stopper in the bottom and a 3/4 inch hole at the base of the tail. There are some small flakes on the base rim and minor finish loss. Additional photos by email. I need your zip code to calculate the postage.